In this bonus edition of Field Pass, get an inside perspective on all six of the programs that you'll see up on the big screen tonight, Thursday, April 24, during "The Countdown," Drum Corps International's spring cinema event. Host Dan Potter offers his own insights in addition to a compilation of commentaries from show designers and those who were involved in the creation of the selected corps productions. Download it, burn it to CD and throw it on in the car on the way to the theater – use this Field Pass as an audio primer to some of the things you'll want to keep an eye out for when you're elbow deep in a bucket of popcorn experiencing tonight's event. 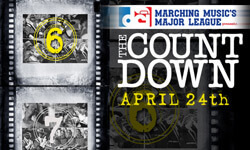 Remember, Drum Corps International's "The Countdown" will air tonight at 7:30 p.m. local time at more than 300 theaters across the nation. See you at the movies! View more about "The Countdown." Check out the Field Pass archive.